Comm Eye Health Vol. 13 No. 34 2000 pp 20 - 21. Published online 01 June 2000. Reaching the goals for increased cataract surgical coverage set out in the VISION 2020 programme will require great effort. Cataract surgical coverage is inadequate in many places, for obvious reasons such as lack of trained manpower and supplies. Even when services are available, however, there are barriers which keep patients from utilising the services. In countries as diverse as India, Brazil, and Malawi it has been shown that 33-92% of cataract blind patients remain cataract blind, even when surgery is available. Understanding why people do not present for surgery and modifying our programmes to reduce these barriers is critical if we are going to increase cataract surgical coverage. The cost of cataract surgery varies widely and may be more than poor people, with little or no disposable income, can afford. It would be a mistake to assume, however, that providing free cataract surgery automatically leads to high cataract surgical coverage. In addition to the surgery itself, there are other costs such as transportation to the hospital, loss of work for the patient or the carer accompanying the patient, and living expenses for the carer while the patient is in the hospital. In Nepal, these non-surgical costs alone were estimated to be one-fifth of the annual income of a rural patient.1 In India, reducing the cost of surgery and providing transportation expenses for the patient has significantly increased the acceptance of cataract surgery.2 Studies in India have demonstrated that most people are willing to pay approximately the average monthly income of their families for high quality cataract surgery. There have been innovative approaches to provide high quality services at a lower cost, and testing and implementing these in other settings should become a priority. Most cataract blind live in rural areas while most ophthalmologists live in urban areas. Use of western medical services (including those for cataract) is related to proximity; people who live far from a hospital tend not to use its services. In Malawi, traditional healers who live far from the hospital provide more ‘cataract treatment’ than traditional healers living near hospitals.3 People will use what is most available to them first (see also M Jalaluddin Khan’s article: Bangladesh Model of Eye Care: page 24). 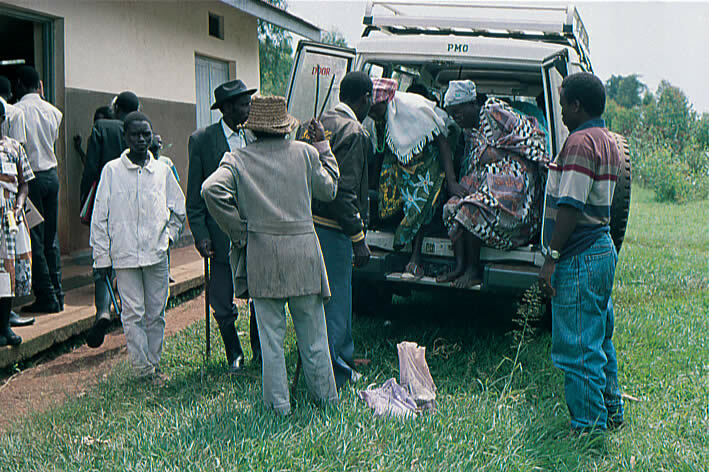 providing transportation (from villages direct to the hospital and return). There is an increasing amount of data demonstrating that women are significantly less likely to receive cataract surgery than men, 1,4-6 in spite of the fact that cataract surgical rates in women are slightly higher than those in men. There are many reasons for this: women are less likely to be literate and have access to information about services; women may not have the necessary social support within the household or community to allow them to receive care; women often do not have adequate control over household financial resources, and women are generally less able to travel outside the village to seek services. making eye care services ‘user friendly’ and so culturally acceptable. how long surgery will take? educational campaigns using available media resources. While satisfied cataract patients can serve as excellent motivators for others to have surgery, patients with poor results can have the opposite effect. Fear of a poor outcome may be a legitimate reason for patients to refuse cataract surgery. Programmes must provide consistently high quality cataract surgery with good outcomes if patients are to develop trust in the programme. It has been shown in India that the conversion from aphakic spectacles to IOLs led to a significant increase in cataract surgical coverage.8 In cultures (e.g., Egypt, Tibet) in which women do not like to wear glasses, the conversion to high quality IOLs may help decrease the gap between men and women. avoiding waiting lists which mean that patients have to return for surgery. Barriers will vary according to local conditions and customs. Conversations with patients, village leaders, and women’s groups may confirm the existence of barriers such as those listed above or reveal unexpected ones. Programmes planning to increase cataract surgical rates will need to determine the barriers in each area, whether relating to costs, distance, cultural/social factors, anxiety/fear or other barriers, and find creative ways to overcome them. 1 Brilliant GE, Brilliant LB. Using social epidemiology to understand who stays blind and who gets operated for cataract in a rural setting. Soc Sci Med 1985;21:553-58. 2 Ellwein LP, Lepkowski JM, Thulasiraj RD, Brilliant GE, the Operations Research Group. The cost effectiveness of strategies to reduce barriers to cataract surgery. Int Ophthalmol 1991;15:175-81. 3 Courtright P. Eye care knowledge and practices among Malawian traditional healers and the development of collaborative blindness prevention programmes. Soc Sci Med 1995;41:1569-75. 5 Courtright P, Kanjaloti S, Lewallen S. Barriers to acceptance of cataract surgery among patients presenting to district hospitals in rural Malawi. Trop Geogr Med 1995;47:15-18. 6 McCauley AP. Primary eye care: rural Balinese attitudes towards eye care and cataract surgery and suggestions for increasing demand for eye care services. Helen Keller International, New York, 1986. 7 Lane SD, Mikhail BI, Reizian A, Courtright P, Marx R, Dawson CR. Sociocultural aspects of blindness in an Egyptian delta hamlet: visual impairment vs. visual disability. Med Anthropol 1993;15:245-60. 8 Vaidyanathan K, Limburg H, Foster A, Pandey RM. Changing trends in barriers to cataract surgery in India. Bull WHO 1999;77:104-9.